A versatile four panel room divider combining elegant dark timbers encasing slatted bamboo. 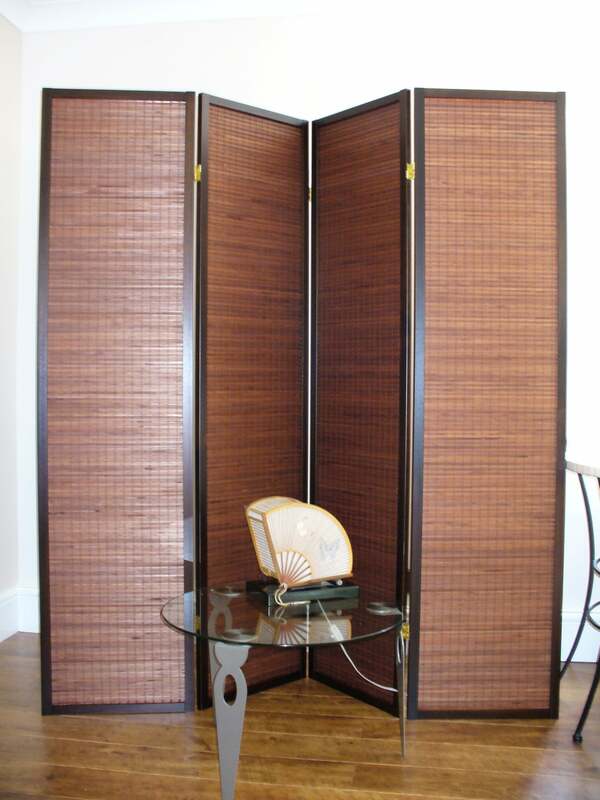 Choose the lacquer finish for your decorative screen..
Formosa 4 panel Room Divider or Screen as they are sometimes known combines Pine wood and flat woven Bamboo for the design inside the screen. The panels are connected with versatile polished brass hinges that operate in both directions so you can stand the your screen any way you choose it’s perfectly stable. The Formosa 4 panel room divider or Screen makes a useful addition to any home or conservatory and is available in a choice of Black or Walnut eco friendly water stain finishes. Creative ways for using these screens include dividing rooms into part office and part living room or bedroom. Free Delivery for your Room Divider takes 1 or 2 working days, usually. The delivery date is guaranteed but it's possible to request an a.m. (08.30-13.00) or p.m. (13.00-18.30) slot, however the request is at the discretion of our couriers who do what they can to comply with your wishes.You can specify a date or I'll suggest a date in the order confirmation email and you can amend as necessary.If you can't be at home on the day of delivery please call 020 7223 7212 or email keith@futonsonline.co.uk and let me know so it can be re arranged, generally the couriers will come back at least once if not twice to try and deliver your order.It is also possible to leave deliveries in a garage, with a neighbour or even at the back of a house so long as the request has been made ahead of time and you feel it's safe to do so.